With other results going their way earlier today, it really has been a great night for Chelsea. The Women's FA Cup winners are now clear favourites to win the league title this season for the first time in their history. They've deservedly beaten rivals Arsenal 2-0 tonight. Thanks for joining us. We'll see you soon. "When you consider how many chances we had, I was disappointed it was only 1-0 at half-time. "We should have ended the game sooner, but I'm pleased with the result." So, Chelsea are top of the league with a three-point cushion. Is today going to prove to be a pivotal day in the title race? They are also now five points ahead of Arsenal, who were not themselves tonight. The whistle goes and Chelsea are convincing winners. It finishes 2-0 and Arsenal were definitely second best. Arsenal are a whisker away from a consolation goal but Jordan Nobbs hits the post. Hedvig Lindahl actually got a slight touch to that, so it will go down as a shot on target - potentially Arsenal's only one of the night. Arsenal almost have a rare chance but Natalia can't quite get a shot on goal. As the ball comes in from the right, Hedvig Lindahl comes out quickly and helps it out for a corner. Arsenal can't muster anything from the resulting set-piece. We are playing four minutes of injury time, by the way. One player who has been quiet but very, very effective as always for Chelsea tonight is their captain Katie Chapman. There was some doubt about her fitness, after she left the ground on crutches last weekend, but she started and she has looked as in-form as ever in that holding midfield role, tidying loose balls up and reading the game superbly. Dominique Janssen is booked for a foul on Drew Spence. Nothing is going Arsenal's way. This game is winding down. Arsenal have not recovered since going 2-0 down and the points look very much like Chelsea's at the moment. Laura Coombs comes on for Chelsea in place of Gemma Davison. The winger has had another fine game for the Blues. Millie Bright comes on for Ji So-Yun, which is a relatively defensive substitution from Chelsea, who will surely just look to maintain this lead now. It is worth mentioning that Arsenal are without some of their most important first-team players due to injury tonight, with long-term absentees Kelly Smith and Leah Williamson still on the sidelines. Captain Alex Scott is also missing today, having suffered a 'knock'. That said, the Gunners will have hoped from better from their team tonight. They have played better than this in recent weeks. Carla Humphrey replaces Vicky Losada for Arsenal in their midfield. Is there any way back for the hosts? Drew Spence shoots high, high over the bar from 25-yards out. That was a bit of a shame, because it had been a very neat passing move from Chelsea. Ana Borges replaces Chelsea forward Eniola Aluko. That is a huge goal for Chelsea. They have a comfortable 2-0 lead and it looks very difficult for Arsenal to find a way back from this now. The Blues are heading for a three-point lead at the top as things stand, but crucially they are heading for a five-point lead over Arsenal, which might almost rule out the Gunners in the title race with just three games left. Fran Kirby almost makes it 3-0 but fires over from seven yards out. Gemma Davison scores from the spot to give Chelsea a potentially-decisive two-goal lead. Sari Van Veenendaal went the right way and got a glove to the ball, but Davison's kick had too much power on it. Chelsea's Fran Kirby is taken down by Emma Mitchell in the box as the ball was going away from goal. The referee signals for a penalty and it is hard for Arsenal to argue with that. Jade Bailey is booked for Arsenal for repeated fouls. Perhaps the Lady Gunners are getting a tad frustrated. Fran Kirby is on the end of a good Chelsea move down the right but Sari Van Veenendaal gets down well to produce a good save. That was an important stop from the Arsenal keeper. Dan Carter is replaced by Jordan Nobbs for Arsenal. It is a first league appearance since the World Cup for the England midfielder after she picked up an injury in Canada. Chelsea have a free-kick in a very dangerous position on the corner of the box after a trip on Hannah Blundell. The cross is whipped in but no Blues heads can get to it and Arsenal clear. Arsenal have improved slightly since half-time, with Dan Carter playing wider on the right and Chioma Ubogagu supporting Natalia going forward on the left. It is more of a 4-3-3 now for the home side. Fran Kirby has time to shoot at goal after a nice tee-up from Ji So-Yun, following Claire Rafferty's burst down the Chelsea left. Kirby strikes it well but the ball keeps on rising and goes just over the bar. Put simply, Arsenal need to test the goalkeeper more. They are yet to worry Hedvig Lindhal between the sticks. The Swedish stopper has been in fine form this season and it will take something good to get past her tonight. Arsenal win a corner down their right. It is played very deep to Natalia, but her shot takes a deflection that takes all the venom out of her strike and trickles to the goalkeeper. And the other end, Gemma Davison fires over Chelsea. Chioma Ubogagu came on for Lotte Wubben-Moy at the break. The American youngster has pace, skill and an eye for goal - can she change this game for Arsenal? Chelsea get the second half under way at Boreham Wood FC where they lead title rivals Arsenal. What does the next 45 minutes have in store for us? As it stands, Chelsea will move three points clear at the top of the league tonight. That's after draws for title rivals Sunderland and Manchester City earlier today. as Rachel Williams' last-minute goal earned Notts County a share of the spoils. That first-half is certainly evidence of that, with Emma Hayes' side causing third-placed Arsenal all sorts of problems without actually having hit any great heights in their performance. The Women's FA Cup triumph earlier this month was their first piece of silverware, are we looking at a side on the march towards their first league title? What did you make of that first half then? Are you a happy Chelsea fan? Or a worried Gooner? Get involved and let us know your views - you can get in touch via #bbcfootball on Twitter. Vicky Losada's unfortunate own goal is the difference between these teams so far, with Chelsea going ahead from that early corner which was deflected in off the top of her head. The Blues have been good value for their lead though and could be further ahead. Can Arsenal respond in the second half? There is the half-time whistle and Chelsea lead at the break. They have deserved it too, so far, you have to say. Chelsea captain Katie Chapman goes into the referee's book for a bit of 'afters' following a late tackle. At the other end, Eniola Aluko has a great chance for the visitors but her low shot is saved by Sari Van Veenendaal. Fran Kirby almost has the second goal of her Chelsea career. She has time to shoot, left-footed, aiming for the top corner from just outside the area, but fires narrowly wide. Another slight let-off for Arsenal. Sari Van Veenendaal is under pressure from Chelsea striker Ji So-Yun and she goes for a risky bit of skill to dribble away from her. She succeeds, much to Arsenal's relief. That was brave! Dan Carter thinks she is through on goal for Arsenal but the linesman deems that she was just offside. 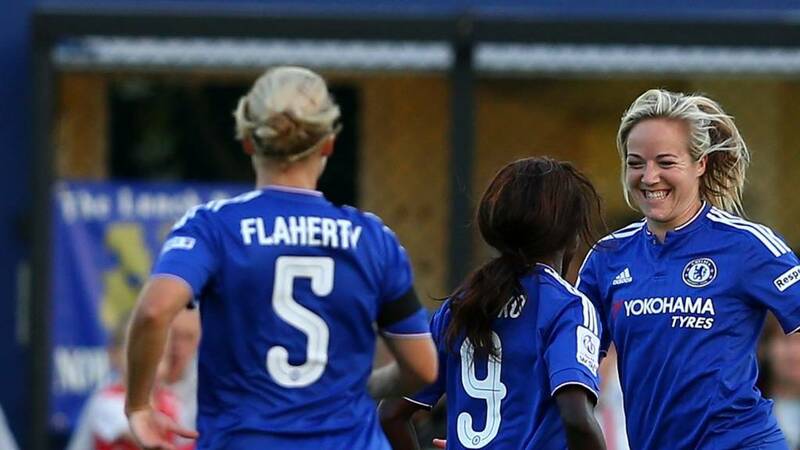 Chelsea left-back Claire Rafferty stepped up just at the last moment, and Carter was marginally the wrong side. That could have been a big chance for Arsenal. Gilly Flaherty is a bit late with a tackle on Natalia and Arsenal have a free-kick, which they take short and it is sent deep towards Vicky Losada and Natalia, and Chelsea don't defend it very convincingly, but they do eventually get it away for a corner. The Blues also get the corner away and the danger is over for the time being. Fran Kirby heads straight at Arsenal keeper Sari van Veenendaal. The England striker was perhaps a bit too far out to trouble the goalkeeper with a header, but it was a decent effort. Arsenal break quickly through Dan Carter and she finds Natalia, but the Spain striker can't find the target with her curling shot. That's the closest Arsenal have come to an equaliser. Drew Spence lashes a powerful, right-footed shot just wide of the post. She had too much room on the edge of the box there and Arsenal won't be overly happy with that defending. Another half chance for the visitors and this time Ji So-Yun strikes the side netting from a very tight angle. Were there better options for her in the centre? Perhaps, but she went for goal, and it remains 1-0 to Chelsea. Chelsea's Ji So-Yun lashes a low shot straight at Sari van Veenendaal but the Arsenal goalkeeper holds it. The Blues have real quality up front and they look capable of scoring at least one or two more tonight. Arsenal are passing the ball around nicely at times but they are still yet to create their first real, clear-cut opening of the evening. If Arsenal are to turn this game around, the chances are that winger Marta Corredera may well play a big part in things. A summer signing for Pedro Martinez Losa's side, Corredera has been in fine form since her arrival in England. Her brace gave Arsenal a 2-0 win away at Chelsea a week ago, when these two teams met in the Continental Cup group stage. Drew Spence has a chance for Chelsea but she can't quite connect properly with her effort from just inside the D.
Down the Chelsea right, Gemma Davison is causing Arsenal left-back Emma Mitchell plenty of problems so far. That's better from the home side. Spain midfielder Marta Corredera does well down the right and her cross forces Arsenal's first corner. Chelsea get it away, but the hosts have picked themselves up well since falling behind. That is not what this home crowd were expecting inside the first 10 minutes. Arsenal have fallen behind in slightly sloppy circumstances. At the other end, Natalia breaks away but her left-footed effort is easily gathered by Hedvig Lindhal. Chelsea are in front and it is an own goal for Arsenal's Vicky Losada. The Chelsea corner came in from the right, it was headed towards goal by Gilly Flaherty and went into the net off the head of Losada. What a start for the visitors! South Korea international Ji So-Yun takes it but her effort misses wide of the near post, much to the frustration of all the Chelsea players who were waiting in the box. Chelsea have a free-kick just outside the area, after a foul by Emma Mitchell on Gemma Davison. Arsenal are enjoying a bit of early territory in the Chelsea half, but we await the first chance of the game. It is worth mentioning that these two teams drew 0-0 when they met in the league at Staines Town earlier this season, on a night when Arsenal arguably edged things. We are under way in this crucial Women's Super League match, as Arsenal kick-off. So, how do you see this match going? We want to hear from you tonight, whether you a fan of Arsenal, Chelsea, or any other team. Get involved via #bbcfootball on Twitter and send us your views and opinions. ...and here is confirmation of the hosts Arsenal's starting team. Here is how Chelsea are lining up tonight. The big team news for top-of-the-table Chelsea is that England striker Fran Kirby makes her first league start for the Blues tonight. For Arsenal, Sari Van Veenendaal makes her first league start in goal, in place of experienced Irish international Emma Byrne, who is on the bench. Gunners captain Alex Scott is not in Arsenal's match-day squad, but there is a start for Lotte Wubben-Moy. Title races are rarely closer than this - just two points currently separate the top four teams in the Women's Super League. Third hosts first tonight, as two fierce London rivals play for far more than simply local bragging rights. Welcome to our live text coverage of Arsenal Ladies v Chelsea Ladies.